KAMPALA – MTN Uganda Chief Executive Officer Wim Vanhelleputte has turned his guns on long-serving general manager Anthony Katamba, after the telecommunication giant’s top executive was summoned to the Chieftaincy of Military Intelligence in a fresh investigation on company’s dealings that are considered “prejudicial to national security”. Mr.Vanhelleputte was on Tuesday summoned by the military intelligence to answer charges that senior MTN Uganda staff, deported from the country last month were allowed access into the telecom’s system to carry on work remotely, apparently after attending an MTN Global leaders conference as part of the Ugandan staff delegation in Dubai a week ago. A senior intelligence official has intimated to this website that Mr. Vanhelleputte was summomed after intelligence got to know of the development, raising questions on why the deported officials should be allowed into a system on a territory where they are persona non grata. It was reported on Tuesday evening that MTN Uganda had purged Mr Katamba, in the aftermath of the recent MTN Uganda’s troubles with government, after he was, among others litanies, accused of leaking information that led to the deportation of senior company managers in question. But it has emerged that Mr Katamba is staying put, sparking off a struggle with the CEO after tensions emerged following the latest CMI summons with Mr. Vanhelleputte accusing his senior manager of sabotage. Mr Katamba who has headed the MTN legal department since 2002, last year came under pressure as his position came under review after the company lost several legal battles against staff in the criminal courts and several other regulatory issues with the Uganda Communications Commission. Mr. Katamba was subsequently sidelined in negotiations for renewal of the operating license with the CEO Mr. Vanhelleputte taking the lead assisted by Board Chairman Mr. Charles Mbiire. However, negotiations with Uganda Communications Commission (UCC) hit a snag and this led to the intervention of President Museveni who issued a directive that MTN Uganda must pay the earlier assessed USD $ 100 million something that did not go well with MTN top honchos in South Africa. The bad blood between Mr. Vanhelleputte and Mr. Katamba has been in the making for the past one year. Accordingly, in June 2018, MTN announced that Ms. Enid Edroma was joining as the new head of legal & regulatory affairs. It later emerged that the CEO timed when Mr. Katamba was on leave to announce the hiring of Ms. Enid Edroma. MTN Group intervened and Mr. Katamba was reinstated leaving Mr. Vanhalleputte ‘egg-faced’. 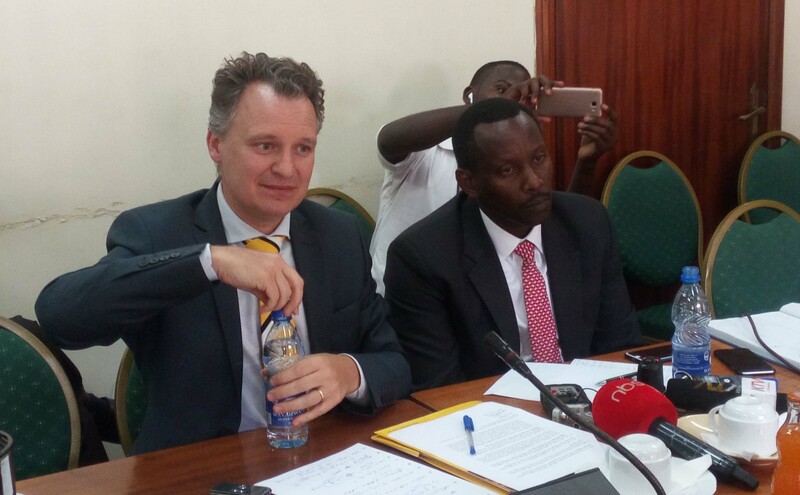 MTN Uganda problems escalated three weeks ago after the Uganda Police deported senior officials Olivier Prentout, a French national, and Ms Annie Tabura, a Rwandan, to France and Rwanda respectively, for allegedly engaging in activities that threaten national security. Ms Elsa Mussolini, the MTN mobile money general manager, was also deported back to Italy after being grilled by the Uganda police Special Investigations Division (SID) in Kireka, near Kampala. The telecom giants are currently operating on a temporary licence after President Museveni insisted they should be charged USD 100 million before their operating licence is renewed.